For camp directors, making sure that bedrooms are ready for the next group of visitors can be an endless battle. Once beds and storage pieces are in place, choosing mattresses that are the right cost, function, and comfort can be daunting. Many low price contract mattress providers offer mattresses that are attractive to the bottom line but often fall short of the durability and comfort expected. Mattress comfort is subjective at best but some basic standards hold true regardless of whether adults or children will be using the mattresses. Typically, 5" thickness for foam mattresses is a good target. While contract providers sell economical 2" - 4" depths, the amount of cushion that those shorter depth mattresses provide is not enough for most campers. As all season use becomes more of a norm, and more camps and retreat centers are looking to reach beyond just catering to kids, installing mattresses that offer enough comfort for adults and children just makes sense. Five inch depth seems to be the right combination of comfort and cost. But, there are more options than just foam mattresses. Very economical recycled content fiber core mattresses have become an extremely popular option. Fiber core mattresses are inherently fire retardant and therefore do not require additional and costly fire barriers. Innerspring and memory foam mattresses are a far more traditional choice and may be worth considering if you will be housing adults. Let's face it; few adults are willing to compromise a good night's sleep. on into the camp mattress market is Correct Tick, a soft, pliable and breathable vinyl that offers all of the other qualities of vinyl. Water-proof and stain-proof, Correct Tick is extremely economical but has a much better feel than old style, stiff vinyls. The least expensive option for sprucing up sleep spaces is to add a mattress cover or encasement to existing mattresses that are functionally fine but no longer attractive. 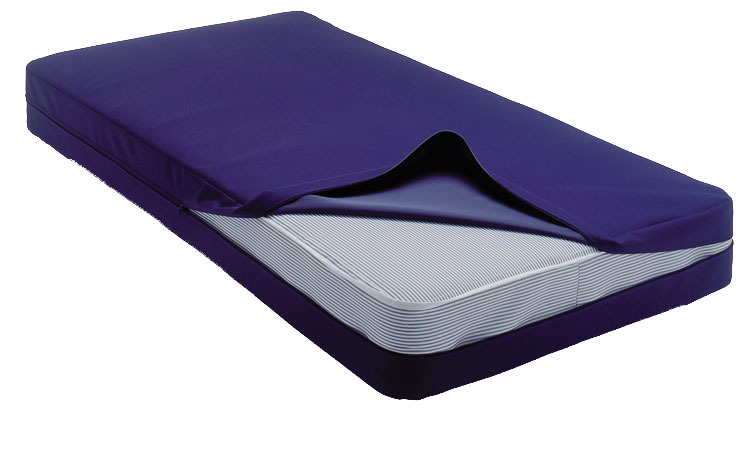 A mattress cover can be slipped over any existing mattress and can be ordered in vinyl (traditional or Correct Tick), nylon, cotton or stretch knit. Mattress covers and encasements can add fluid resistance, bed bug protection and a fresh look to existing mattresses.